This compact area is named after Reverend Sir George Wilmot-Horton, 5th Baronet of Osmaston, and was applied to the area by the local post office in 1887. The extent of the area runs from the Canal Bridge to Deadman’s Lane; the latter named from the medieval track that lead to the plague pit dug beyond the Borough of Derby’s boundary in 1348 during the Great Plague or Black Death. Wilmorton was carved out of the Osmaston Hall estate which was broken up in the 1880′s. 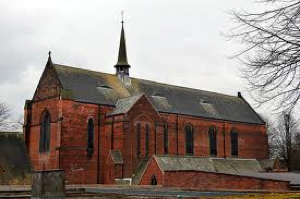 Most of the houses were built by the Midland Railway Company and a school was opened in 1893 and in 1904 a church in red brick dedicated to Saint Osmund. The inn, The Navigation on the London Road was originally built in 1796 when the canal opened, and re-built in 1895 to a design by the Derby architect James Wright. At the same time a new public house was built on the corner of Dickinson Street and London Road called the Portland Hotel. Behind the housing the London Midland and Scottish Railway Company constructed a railway college in 1937 in a Neo-Classical style. Subsequently this became the Wilmorton College of Further Education. These have now given way to a housing development called City Point and the opening to the Pride Park Commercial area, which houses the new home of Derby County Football Club.